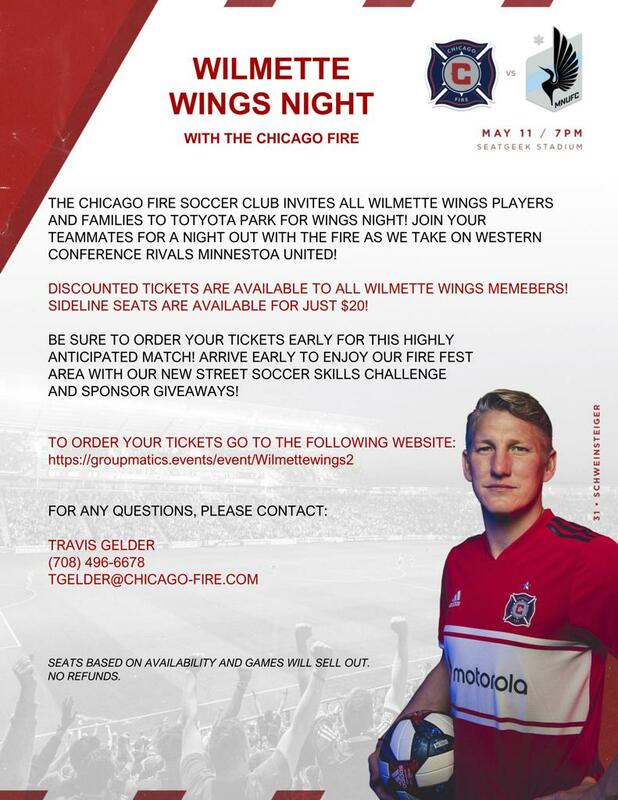 THE CHICAGO FIRE SOCCER CLUB INVITES ALL WILMETTE WINGS PLAYERS AND FAMILIES TO TOTYOTA PARK FOR WINGS NIGHT! JOIN YOUR TEAMMATES FOR A NIGHT OUT WITH THE FIRE AS WE TAKE ON MINNESTOA UNITED! DISCOUNTED TICKETS ARE AVAILABLE TO ALL WILMETTE WINGS MEMEBERS! BE SURE TO ORDER YOUR TICKETS EARLY FOR THIS HIGHLY ANTICIPATED MATCH! ARRIVE EARLY TO ENJOY OUR FIRE FEST AREA WITH OUR NEW STREET SOCCER SKILLS CHALLENGE AND SPONSOR GIVEAWAYS! DISCOUNTED PARKING IS AVAILABLE AT THE LINK BELOW. USE CODE "PARK15"